If there is any food more estranged from this culinary moment than the corn dog, it would be hard to find. The corn dog is not local and organic. It is not, usually, hand-crafted and artisanal. There is nothing farm-to-table about the corn dog – though there’s plenty that is nose-to-tail – and you absolutely should not sprinkle it with a chili salt or drizzle it with an infused oil. Salty, greasy, fried, processed, packaged, cheap, convenient, probably carcinogenic: the corn dog is the archenemy of the superfood. As such, it seems like something that should be made and served by someone else. A fair vendor, ideally, but also a lunch lady. In a pinch, you can heat a frozen one in your oven. But as for actually making one from scratch? By hand, sort of? What in the world for? It seems like a fool’s errand. I was that fool. Call me Corn Doggy Dog. I love corn dogs. Sort of. Maybe what I mean is that I used to love corn dogs, and then I turned loving corn dogs into kind of a thing. A personal meme. A little joke. I like to say corn dogs are nature’s most nearly perfect food, and I have kept saying it even as the truth of the matter has shifted, and I’ve gotten more and more interested in all the actually good food the world has to offer. At this point – now that I’m steeped in Food TV and foodie magazines, now that I’m familiar with the Maillard reaction and how to chiffonade basil, now that I’m supplied with several kinds of sea salt and completely susceptible to the latest twee, precious food trend – corn dogs belong to a special category of guilty-pleasure food. Call it discomfort food: Foods that you are compelled to eat – like finger steaks or Quarter-Pounders – by something deep in your monkey brain, something that calls to you from your childhood, even as the pleasure of eating them no longer holds up against the intestinal unpleasantness that follows. The corn dog’s parentage is murky. Wikipedia says it was developed by Germans trying to make their sausages more palatable to Texans. Some misbegotten people call them Pronto Pups. It’s a fair staple all over the world, and corndoggers from Texas to Minnesota to California claim to have invented it. Corn dogs are one of the regular menu items at my son’s elementary school. I get two if I happen to join him for lunch on corn dog day. They are also staples of the gas-station hot counter – the saddest of all food sources – and grocery store delis. You can buy them premade and heat them up at home, of course. But the perfect expression of the form – the cave-wall corn dog, the Ur-corn dog – are the ones you get at a county fair or Pig Out in the Park, hot from the oil, bronzed and crispy on the outside, unfussed-with. When the notion of a corn dog story for the Food section came up, that was what I had in mind. Our food editor, Adriana Janovich, had other ideas. Janovich has filled the pages of the S-R’s food section with interesting stories about drinking vinegars and fresh chickpeas and all manner of things that corn dogs are not. This one was not, to put it mildly, up her alley. Adriana tried to come up with something a little less low-brow. She tried a few variations on her own, before we teamed up – but they came out grease-sogged and salty, and the process was hot and messy, she said. 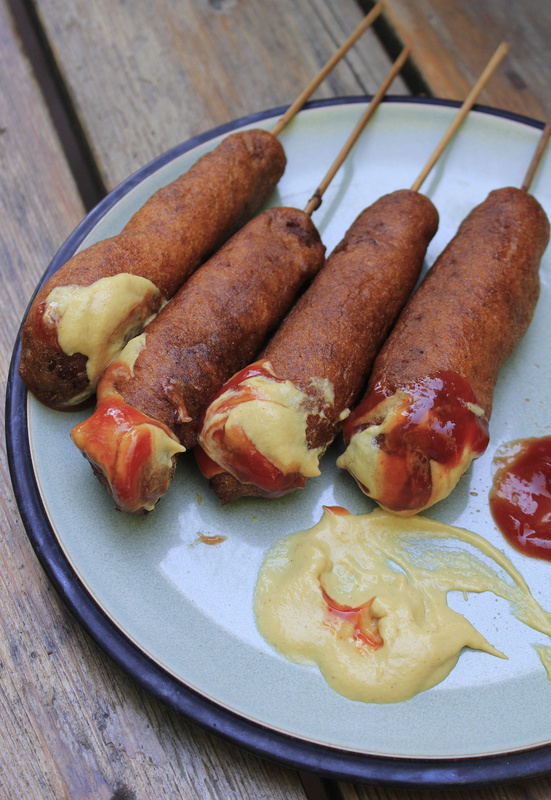 We scaled it back to the classic: The Iowa State Fair corn dog recipe. My assumption was that we would fail, that we would produce corn dogs that were worse than average, and that we would establish that the corn dog is not a food for the home cook, even for the home cook who likes corn dogs. On the appointed day, Adriana showed up in my kitchen with provisions: some Nathan’s Famous hot dogs and some leftover Hebrew National dogs from her attempt to foodie-fy them; cornmeal, buttermilk, bamboo skewers, peanut oil. My 7-year-old son signed on as a duster and dipper, and we were set. Peanut oil went into the Dutch oven. I couldn’t find the candy thermometer, so we winged it, heating the oil over medium high heat, and occasionally plopping in a bit of cornmeal batter to see how hot it was getting. When it seemed right, based on nothing more than the sizzle, we proceeded. Adriana impaled the dogs, my son dusted them in flour and dipped them into the thickish cornmeal batter in a tall drinking glass, and I lowered them into the hellfire and tended them. They fried up gorgeous and brown, with the lumps and imperfections of a homemade thing. I piled the fried corn dogs on paper towels. It was exceedingly easy, though a bit messy. Some wine and beer may have been involved. All cooking decisions were made by sight and instinct – I pulled them when I thought they looked done. We let them “rest” – or perhaps “dry” – and then tried them. That summed it up for me, too. Pretty tasty, but by no means a revelation or a major improvement. “These are better,” he said. They were fine, these corn dogs. Perfectly acceptable. Not failures at all. I had two, just to be sure.